Jim Zub and artist Ramon Bachs take us deep into Dreamfinder and all of his doubt in Figment 2 #4, "The Legacy of Imagination Part Four: The War Within." 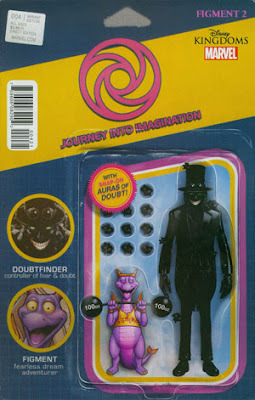 With Dreamfinder and the Academy Scientifica-Ludicus possessed by doubt, it is up to Capri, Dreamfinder's modern relative, Figment and Capri's imagination creation Spark to face the doubt inside Dreamfinder to overcome the Doubtfinder. Can Capri prove herself a hero and provide a "spark" in the darkness of doubt? Spark is cute! Okay, I am personally not a big fan of cats, sorry. But Spark and his rhyming sayings are super cute and give hope in the midst of a time of darkness and doubt. Some of Spark's rhymes also sound like Easter Eggs to the keen eared Disney fan! And Carpi is an inspiring young lady, one that readers of all ages and genders can aspire to be more like in this time of doubt and fear. The story at times feels more horror than fantasy, and despite being a fan of of horror I still liked this issue. The Between Kid also enjoyed the story and kept the Between Kid's attention. Sometimes all that is needed is a spark of hope...of imagination. Capri faces Dreamfinder's deepest fears in Dreamfinder 2 #4. The story combines horror with fantasy while still providing an all-ages romp that everyone can enjoy. And I really look forward to finding out in the last issue Dreamfinder and Figment both defeat the doubt and make it home!